Michelle Ritchie is an organics and permaculture edcuator with a background in resource management (she holds a Masters in Regional and Resource Planning). 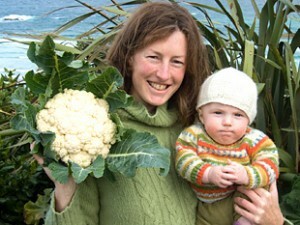 Michelle is responsible for the ongoing development of Otago Polytechnic’s LivingCampus. Michelle describes the transformation of Otago Polytechnic’s campus into an integration of community garden and focus of sustainability education. People come to the garden, ask questions “how do I plant a bean?” but quickly move on to realising “something bigger is going on here”. The LivingCampus then becomes a prompt for questions like “how did I get here today?”, “what is it I’m eating?” and “how do I make changes to my life?”. Shane’s number of the week: 120 is the number of kakapo left. Sam’s joined-up-thinking: How could we promote not-buying stuff? Sam explores three options: trying to be impervious to marketing; removing all marketing; and recognising the value of marketing (full text here).